March 21, 2019, 7:15 p.m.
40% of Americans believe President Donald Trump and his administration have negatively impacted healthcare, while 31% say they’ve made it better. 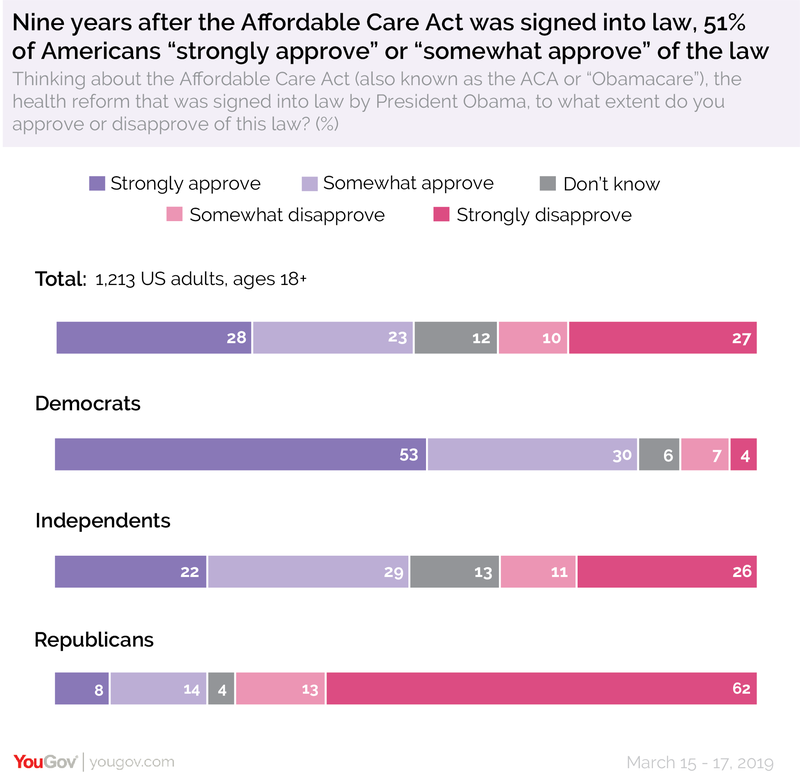 Nine years after it was signed into law, half of all American adults (51%) approve of The Patient Protection and Affordable Care Act of 2010, nicknamed “Obamacare,” new YouGov research shows. Support for former President Barack Obama’s signature policy has increased by five percentage points since June 2017, when the Republican-led Congress was drafting President Donald Trump’s healthcare priorities. Eight in ten Democrats (83%) approve of Obamacare, while only 11% disapprove. In contrast, only two in ten (21%) of Republicans approve of the healthcare law and 75% disapprove of the health reform bill that was signed into law by Obama. The legislation created an individual mandate that said all Americans needed health insurance, required a minimum set of benefits from insurance companies, and made it illegal to discriminate against people with pre-existing conditions. Even as a slight majority of Americans approve of the Affordable Care Act in 2019, backing for the law is hardly bipartisan. Only 13% of Republicans say they have personally benefited from the legislation, compared to 46% of Democrats and 23% of Independents. The data shows that Black Americans are notably more likely than the general population to say they have personally benefited from the Affordable Care Act (43% vs 28%). Americans with a postgraduate degree (41%) are also more likely than the average American to say they benefited from Obamacare. More than halfway through his first term, the public is divided over President Donald Trump&apos;s approach to healthcare. Fewer than one-third of Americans (31%) say Trump&apos;s administration has positively impacted healthcare, while 40% say Trump has negatively impacted the system. The Affordable Care Act remains largely in-place after the Trump administration failed to repeal it, but the mandate that required all Americans to have health insurance or suffer tax penalties was removed. Confusion surrounding these two points remains somewhat prevalent—13% of Americans believe the ACA was successfully repealed, while only about half of US adults (49%) know that the health insurance mandate was removed. See the full YouGov results from the poll here and learn more about YouGov RealTime Research. YouGov Methodology: Total sample size was 1,213 US adults aged 18+, including 425 Democrats, 324 Republicans, and 310 Independents. There were 393 people who voted for Donald Trump in 2016 and 414 people who voted for Hillary Clinton. The responding sample is weighted to the profile of the sample definition to provide a representative reporting sample. Interviews were conducted online between March 15-17, 2019.